After few days playing in Indonesian theaters, my wife and I only saw this movie today during my personal leave from work. As we wanted to spend our time enjoying the places we stayed during our unusually long weekend staycation, we decided to postpone watching it after checking out from the last hotel we stayed in. We had to go back home first and thus it made more sense to buy the tickets in the nearest theater, Setiabudi XXI. Now let us continue with the movie. When the climate changes almost destroyed earth in 2019, a system with multiple satellites connected to one another was created with the nickname "Dutch Boy" under the cooperation of 18 countries including US. The system was able to successfully "control climates" and avoid natural disaster on earth. All these satellites were being controlled by a climate space station outside earth with crew from various countries under the command of Jake Lawson (Gerard Butler - 300, London Has Fallen etc) who happened to create Dutch Boy. After 3 years of doing just fine, Dutch Boy seemed to start malfunctioning. Max Lawson (Jim Sturgess - 21, Cloud Atlas etc) who was Jake's brother and now in command, was tasked by the president Palma (Andy Garcia - The Godfather Part III, Ocean's Eleven trilogy etc) to find out the problem. Max' boss Dekkom (Ed Harris - Apollo 13, The Truman Show etc) insisted Max on asking Jake's help. Though reluctant, Jake who now had to take care of his daughter Hannah (Talitha Bateman - The 5th Wave, Annabelle: Creation etc) decided to assist. When Jake finally returned to the space station, things were not like it used to. He would meet with the person in charge Ute Fassbinder (Alexandra Maria Lara - Rush etc) and some of her most important crews. Meanwhile, Max also had his own personal matter involving his girlfriend Sarah (Abbie Cornish - Sucker Punch, Robocop new version, etc). So what caused he malfunction of Dutch Boy? Could Jake find the problem and solve it? And could Max help his brother from earth? Find them all in this quite interesting and surprisingly entertaining disaster movie. It has been a while since there was a disaster movie playing in theaters. I guessed movie producers might worry of audience getting bored watching the earth being destroyed again and again by natural disasters in movies like 2012 or The Day After Tomorrow. The last disaster movie that I could think of was San Andreas but that was on a smaller scale in the US only. So when I found out there was going to be a new disaster movie with Gerard Butler as the lead character, obviously I was intrigued. For a disaster movie, I think this one was a bit unusual. Most of such movies that I saw would have a formula of small scale disaster happening in some place which would lead to scientists found out about bigger danger on global scale that could destroy the country or even the world, with a very small chance of stopping it and only few people could complete the mission. But this one, in addition to that similar formula, there was a side story which was a bit more like a mystery. It became rather unique and I think it was what the director Dean Devlin (in his directorial debut) was hoping for, to create something different. Although whether it would be a recipe for a successful movie or a disaster, remains to be seen. I myself felt that the mystery became a bit of a distraction at the earlier part and wanted to just focus/concentrate on the disaster part. But after a while, I became accustomed and chose to enjoy it. In fact I think it became a rather integral part of the movie and in the end it added the element of suspense (though the mystery was not that difficult to solve by us audience). My wife and I quite enjoyed the movie but not the beginning which was kind of having slow pace. The second half of the movie was totally interesting and it was having a much faster pace. The natural disasters became frequently shown and some of the special effects were good especially in the Orlando part or the scenes involving climate space station. However the CGI on some of the other disaster scenes were not spectacular and a bit obvious generated by computer. The sound effects of the film were good but not that awesome. The movie also had some funny moments but it had a lot more emotional moments, particularly the ending sequences which were a lot to take by my wife and even affected me a bit. As usual Gerard Butler gave his tough guy persona in this movie. Andy Garcia was charismatic while Ed Harris who used to be very good was not too convincing here. The young Tabitha Bateman seemed very mature in here (my wife was the one noticing this). Jim Sturgess and Abbie Cornish had quite good chemistry and Daniel Wu and Zazie Beetz were also OK in smaller supporting roles. The rest of the cast gave adequate performances. Overall I think the movie was pretty entertaining and enjoyable without overthinking it. It was not a heavy drama, only very brief kissing scene and I think quite safe for the whole family to see. 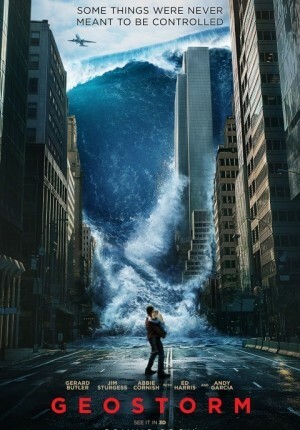 So those of you who are thirsty for some disaster movie, then this one should be able to satisfy you. But be warned that this is not your standard disaster movie with long duration and a lot of characters development as it is also combined with some mysteries and having short duration of less than 2 hours. However, if you are looking for a drama disaster movie, then perhaps this one might not be to your liking. The choice is yours.